The last three books I’ve read were all great. The first one was Uncertain Path by Bill Tweed. We had the good fortune to meet Mr. Tweed during our stay at Bear Paw High Sierra Camp. On the way home, we stopped at the visitor center at Grant Grove, and they had this book. It reads just like the way he talks; casual, engaging, and informative. I can recommend this to anyone who has in interest in the Sierra Nevada, wilderness, or things that are interesting. 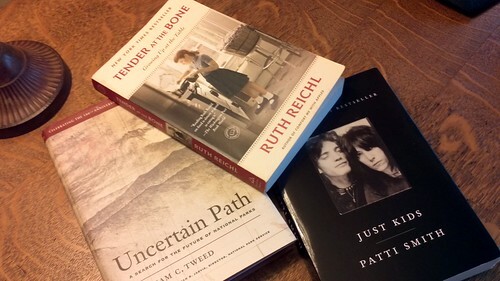 After that, I got going on Tender at the Bone by Ruth Reichl, which was recommended to me by the Resident Expert. I’ve started to build an interest in food, and there’s a lot of food talk in this book. She’s describing her crazy family and wild adventures, using food and cooking as the context. If you eat food, or know any people, you will find this book to be enjoyable. And I’ve just finished Just Kids by Patti Smith. This one might just make it into my top ten favorite books of all time. I often feel that way after reading something that’s really good, but this one is very likely destined for my bookshelf hall of fame. There are a great many instances of well-chosen words in this book. I won’t try to describe what makes it so good, but I encourage you to check it out.